All of the diamond drill holes were drilled on an azimuth of 360 degrees at an inclination of -50 degrees. Drill holes M3 DDH01, 03 and 05 were collared on the same section line. Drill hole M3 DDH03 was collared 40 metres south of M3 DDH01 and M3 DDH05 was collared 80 metres south of M3 DDH03. 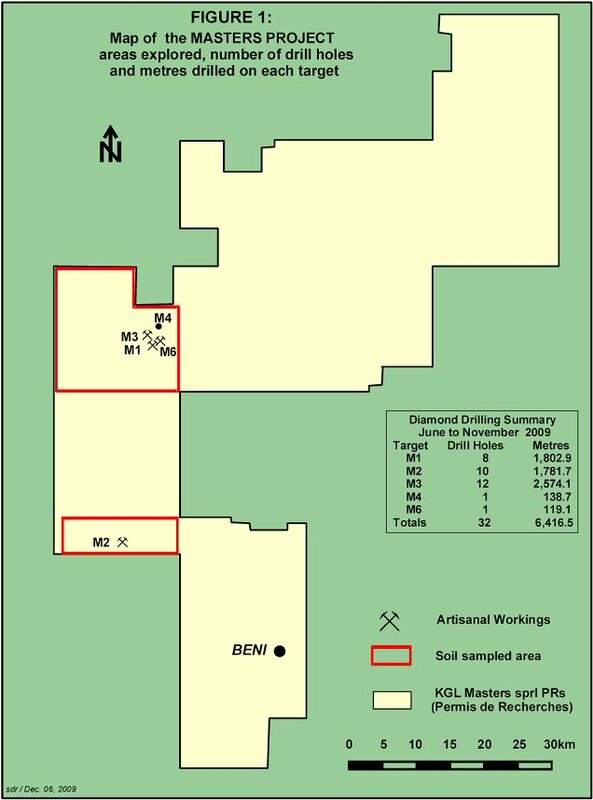 Diamond drill hole M3 DDH02 was collared 160 metres due west of M3 DDH03. Assay results indicate that multiple gold bearing zones are present. The gold intervals reported herein are drill core lengths; true thicknesses and orientation(s) of the gold zones are unknown. Assaying of un-sampled drill core on both sides of several of the gold intersections reported on herein will be carried out to verify if the entire drill core length of these gold bearing intersections has been determined. During the period of June to November 2009 the company completed a total of 6,416.5 metres of diamond drilling in 32 drill holes on 5 target areas. Logging and sampling of the drill core is in progress and results will be reported when received. Figure 1 illustrating the property and areas targeted can be viewed on the website of the Company. The drill holes on the M1, M3 and M6 targets intersected intermediate metavolcanics and tuffs, felsic volcanics, chert, silicate facies iron formation, clastic metasedimentary rocks, mafic intrusives, and quartz veins. Mineralization consisting of pyrite, pyrrhotite, and minor sphalerite, chalcopyrite and galena is present. The drill holes on the M2 target intersected granite, sheared granite, mafic intrusive, mica schist and quartz veins. Pyrite mineralization is present within the granite. The drill hole that evaluated the M4 target intersected granite with several narrow quartz veins. Selected sections of the drill core were sawn in half; the sampled half of the core was placed in a plastic bag, a pre-numbered sample tag was inserted and the bag was stapled shut. The Company's quality control procedures include the insertion of commercial standards and blanks with each batch of drill core samples submitted for sample preparation and analysis. The samples were transported from the DRC by a commercial carrier to ALS Chemex in Mwanza, Tanzania, for sample preparation. Following sample preparation a pulp of each sample was couriered to ALS Chemex in Johannesburg, South Africa where gold analysis was carried out by the FA-AA method on a 50 gram charge. ALS Chemex is an internationally accredited laboratory. The diamond drilling program was planned and supervised by geological consultant, Stanley Robinson. Stanley Robinson, M.Sc., P.Geo is the qualified person under National Instrument 43-101 who has reviewed the scientific and technical information contained in this release.